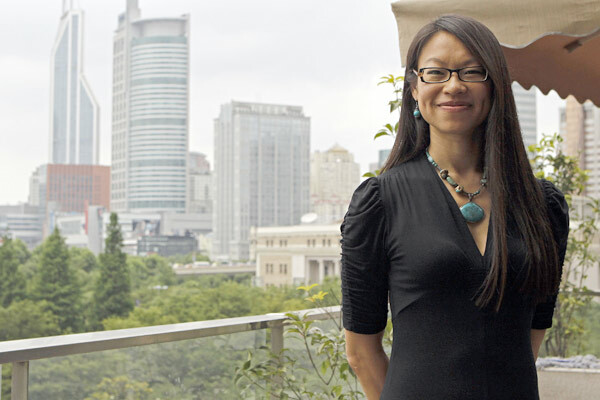 SHANGHAI - When Nancy Pon decided to shoot a one-minute Touchmedia video to be screened on the backseat televisions of cabs, she never expected people would track her down and make her a celebrity. When the video featuring Pon - dolled up with two pigtails, a Barbie pink ribbon on her head, heavy makeup, a blue tank top and extremely exaggerated facial expressions - hit the road in early June, it became an overnight sensation online and local media were quick to pick up on it. And suddenly the 39-year-old Chinese Canadian, general manager of Touch Events, which organizes events by Shanghai-based Touchmedia, found herself bombarded with interviews. "I told them (the creative team behind the video) the only way I will do it is making me look so different that nobody can tell it's me," laughed Pon, recalling the moment when the creative team decided to launch an in-taxi workout and picked her as an ideal candidate because she is healthy and understands the campaign. In real life, Pon wears a deep V-collar one-piece dress, high heels and a turquoise stone necklace, quite a contrast to the quirky-looking fitness coach who reminds one of the days when stars like Olivia Newton-John were prevailing in show business. Pon, born and raised in the town of Turtleford, Saskatchewan, in Canada, said she was thrilled to find that the one-minute video took taxi riders in Shanghai by storm and now so many people are talking about health. Some taxi drivers even receive complaints when they don't offer the video in their cabs. "Such a reaction is fantastic," she said, though it comes with a little sacrifice. "I'm actually quite a private person. Don't really go out that much. I like that no one recognizes me." But that seems impossible now. "Quite a number of my friends texted me immediately after they saw me in the taxi, skeptically saying things like 'Is that you?' or 'No, it can't be Nancy.' Something like that," laughed Pon. "I even warned my boyfriend that I had shot a very stunning video for the screen. We saw it once together right in the taxi. And I said: 'I warned you.'" Off screen, Pon leads a regular and healthy life. She usually gets up around 6 am in the morning, does some reading or painting, goes to bed between 10 and 12 pm at night, and tries not to skip any meals. And she seldom goes to bars or KTVs at night. She has even stuck with doing push-up exercises each morning. "I got up one morning and was astonished to find my body stiff. It's ridiculous. Therefore, I started to do push-ups in 2008 and have carried it on," she said. "I started with one push-up every morning and it was so difficult. But starting from the beginning of this year, I can do 30 push-ups smoothly." Pon tries to exercise everywhere she goes. Even at airports, where people usually spend a lot of time waiting to board, Pon will find some quiet place to do push-ups while people stare at her with strange looks. "I don't mind. People have to carry on exercising. When you are young, your circulation is good and probably you can abuse your body, like going to bed late, skipping meals. But what if you get old?" she said. Pon's fitness video in the back of cabs will be replaced on July 1 with another character - her colleague at Touch Events. Asked if she will make another video for the campaign, Pon said she doesn't know yet. "I want to get away from it as fast as I can. But if acting in a video helps people focus on their health, then yeah, I would. If it takes crazy characters to help people, then it's worth it," she told local media.